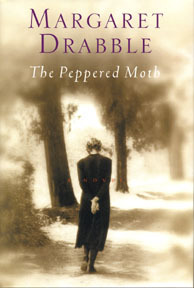 Margaret Drabble. Harcourt, Inc., New York, 2001. A novel that is in its deepest sense about survival of the fittest, The Peppered Moth recounts the survival of feminist thinking through generations of a family in souther Yorkshire in Greatr Britain. A coal-belt region that slowly changes to a trash dump center, the surrounding form the central metaphor of the novel. Just as the peppered moth adopts the color of its surrounding, so too do the narrators ancestors, changing with the times. The narrative centers on the grandmother Bessie, intent on changing her depressed neighborhood for the better, alternating with the present Faro, who in her own way fights the ame battle. The lives of the four generations of women comment on the environmental pollution of the town in which they live, Breaseborough. The author siezes on mitochondrial DNA, which passes from mother to daughter, as a way of conveying how the legacy of character is passed on among these women. A meditation on family ties and Mendelian inheritance, this novel is both absorbing and deeply mischievous. Faro wonders why she has never travelled far from Breaseborough, why some of us stay in the roles prescribed by family and kin, while others wander far afield. Good question. Good novel.